A DSLT features a fixed, translucent mirror. You may have seen reference to SLT, or DSLT, cameras in the past few months and wondered what on earth the article was going on about - or assumed that a typo had been made. 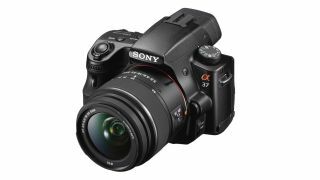 However, these cameras are different from their DSLR counterparts. Looking almost indistinguishable from the outside, it is the interior of the camera that makes a DSLT different from a DSLR. First pioneered by Canon back in the 1960s, modern digital cameras didn't use the "pellicle" or fixed mirror design until the introduction of the Sony Alpha a33 and a55 in 2010. SLT stands for "Single Lens Translucent", with the cameras incorporating TMT (Translucent Mirror Technology), a translucent mirror that allows roughly 70% of the light entering through the lens to pass directly through it and onto the imaging sensor, while a smaller amount, around 30% is reflected up to the camera's phase detection autofocus (AF) sensor. This means that the mirror, rather than flipping out of the way as in a traditional SLR camera, remains fixed in place, speeding up the time taken to record a shot and allowing for fast, full-time phase detection AF. Other advantages of the design include less camera shake due to the mirror not moving, no viewfinder blackout during shooting, and settings such as exposure compensation and ISO can be more easily viewed on the electronic viewfinder. Of course its the speedy shooting and snappy AF that are the main advantages of the DSLT design, but that's not to say that there aren't a few drawbacks as well. For starters, the reduction in the amount of light hitting the sensor means that there can be issues with low-light performance. Also, because the the fixed mirror only transmits 30% of the light reaching it an optical viewfinder isn't an option - the viewfinder would be very dim. This means that an electronic viewfinder (EVF) is necessary. Although EVFs have been unpopular to date, Sony has worked really hard in this area and it now produces some excellent units. At the moment, only Sony is using DSLT technology, but with the Sony Alpha a77 already scooping a number of awards and the technology used within the camera, such as the viewfinder, trickling down into other cameras, such as the NEX-7 compact system camera (CSC), it'll be interesting to see if other camera manufacturers also begin to explore the DSLT route.